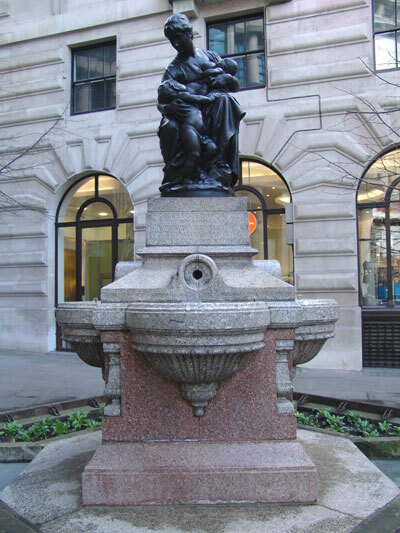 Under contract to the City of London, we regularly maintain over 80 public sculptures, fountains and plaques including this drinking fountain, commissioned in 1878 by the Drapers and Merchant Taylors' Companies and presented to the Corporation by John Whittaker-Ellis. 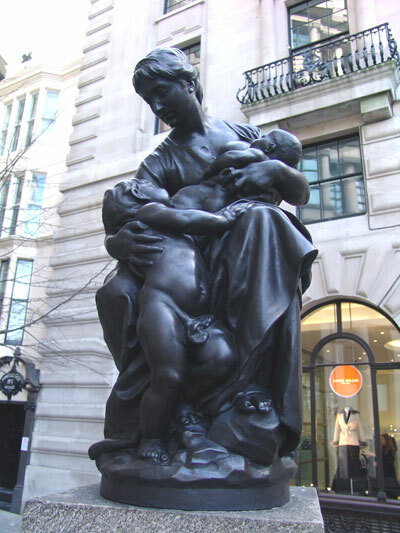 The Grade II Listed drinking fountain is constructed in light grey and red granite and is capped with a bronze statue of Maternité by Jules Aimee Dalou, a highly respected and important sculptor of the time. The fountain has a rectangular stepped and moulded pedestal base decorated at the corners with inset quarter columns and on each side four large carved drinking bowls. Each bowl is fed by water spouts situated on raised stone turrets above each bowl. The bronze sculpture stands on a simple block at the top of the pedestal. The fountain stands on a modern raised concrete secondary plinth with steps, flowerbeds and seating. Presumably this was designed and constructed in the 1980’s when the fountain was moved. The granite base is inscribed: ERECTED 1878 / AT THE EXPENSE OF / JOHN WHITTAKER ELLIS ESQ ALDERMAN / WILLIAM HARTRIDGE ESQ DEPUTY / SUPPLEMENTED BY A VOTE IN WARD MOTE / ALSO BY DONATIONS FROM / THE DRAPERS COMPANY AND THE MERCHANT TAYLORS COMPANY. The fountain has been through a few changes in its lifetime: originally it was topped by Dalou’s marble sculpture but this deteriorated rapidly, was replaced by a bronze copy C.1897. That original marble appears to have been lost but another marble version of the subject exists at the V&A. * Originally it also had an elaborate, pillared canopy (removed 1954)* and there are areas on the granite base where repairs were made after its removal. It originally stood where Peabody is now sited adjacent but was moved to its present position in the 1980s* - the hexagonal drains are still there around Peabody, with most grilles intact. Dalou first exhibited at the Paris Salon in 1867, but when implicated in The Commune in Paris, he took refuge in England in 1871, where he rapidly made a name through his appointment as a tutor of modelling at South Kensington. There he laid the foundation of the development of the modern British school of sculpture, and at the same time executed a remarkable series of terracotta statuettes and groups, such as 'A French Peasant Woman', of which this sculpture is a bronze version. He returned to Paris in 1880.